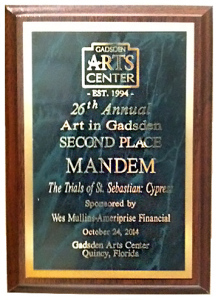 MANDEM (FSU Art MFA ’15 Maize Arendsee) took Second Place at the 26th Art in Gadsden Exhibition of Fine Art at the Gadsden Arts Center in Quincy, FL. The award was presented at the public reception on Friday, October 24 by juror Ljiljana Obradovic-Edmiston. This exhibit was the debut of MANDEM’s “Trials of St. Sebastian” painting series, in which religious memes from classical art history are re-imagined as discourse on the diseases of postmodern society. 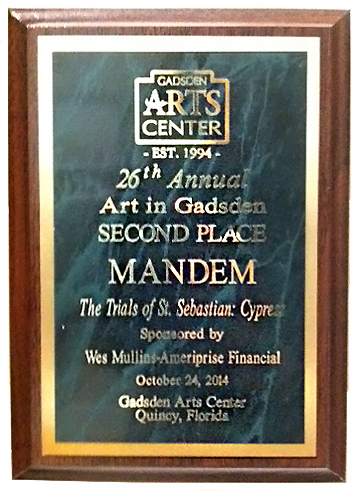 * Second Place, 26th Art in Gadsden: Exhibition of Fine Art, Gadsden Arts Center. * Second Place, PINNACLE National Juried Exhibition, Foster-Tanner Fine Arts Gallery. * First Place, Summer Annual Exhibit, FSU Museum of Fine Arts. Art is Gadsden exhibit is open through December 23.